NRA-ILA | Will America’s Safest Hunters Save America’s Hunting? Who`s the safest hunter in your family? According to "Families Afield," a research report compiled by the National Shooting Sports Foundation, the National Wild Turkey Federation and the U.S. Sportsmen`s Alliance, the safest hunters in the woods are often the youngest hunters in the woods. According to NSSF`s Steve Wagner, "National statistics show that young hunters, particularly when supervised by an attentive parent or other responsible adult, are involved in only small fractions of hunting accidents. 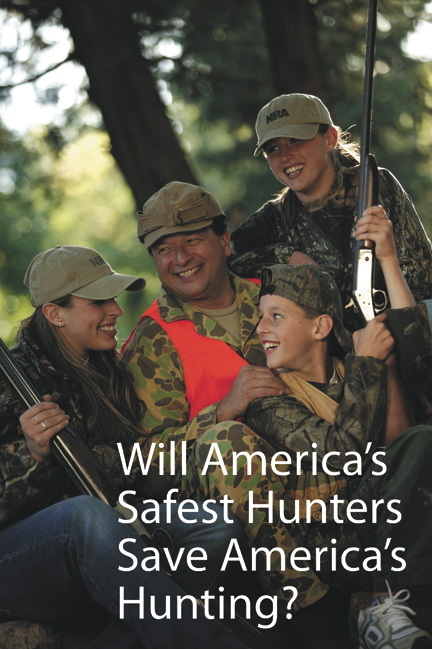 Even in states where youngsters can legally hunt at age 8 or even earlier, hunting accidents are extraordinarily rare." In fact, New York state found that supervised junior hunters have the lowest injury rate of all hunters. That`s pretty safe, considering that hunting is about 17 times safer than playing football, and ranks far behind soccer, basketball, baseball, tennis, even cheerleading in the number of injuries to participants. Still, some state game departments stand by old misconceptions and put up high hurdles to keep young people out of the woods, and that could pose a real threat--not just to hunting, but to much more. "American hunters are one of the core, bedrock constituencies of the Right to Keep and Bear Arms," said NRA Executive Vice President Wayne LaPierre. "If unnecessary or unreasonable roadblocks are being raised to stop young and novice hunters, then those roadblocks need to be removed. Our hunting heritage, and our firearms freedom, could one day depend on it." Just 20 years ago, hunters accounted for nearly 10 percent of the U.S. population. Yet, within two more years, if current tends continue, hunters will make up just 5 percent of the population. Worse, as the number of hunters drops and their average age advances, fewer and fewer of them appear to be passing along that heritage to their children. According to the U.S. Fish and Wildlife Service`s National Survey of Hunting, Fishing and Wildlife-Associated Recreation, on average, just one out of every four children from a hunting household actively participates in hunting. One way to assess the health of hunting in America is to use the same models biologists use to gauge the health of wildlife populations. For a wildlife population to be stable, every individual of a species lost to disease, predation or old age must be replaced by another of that species, in a 1-to-1 ratio, through a process known as "recruitment." If you look at the recruitment rates of American hunters, you see we already may be endangered. 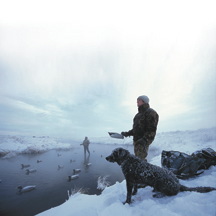 Since most hunters are introduced to the sport as youngsters, and since few adults take up hunting if they weren`t exposed to it in their youth, common sense suggests that having a stable population of hunters requires that the percentage of youth hunters should match the percentage of adult hunters. But it doesn`t. Not even close. Indeed, nationally, if you compare the percentage of the population between the ages of six and 16 that hunts, with the percentage of the population over age 16 that hunts, instead of getting the 1-to-1 ratio needed to maintain current levels, you get just 0.69-to-1. Stated simply, we may be about 31 percent below keeping our heads above water. Putting Logic into the Laws "Fifty years ago, most kids started hunting at an early age as a form of family recreation and to help put food on the table," said Dawson Hobbs, NRA-ILA manager of hunting policy. "Today, with 160 satellite tv channels, video games and everything else, young people have never had so many activities competing for their attention. If we don`t involve them early on, we`ll lose them to those other activities." The problem is, in several states the law won`t allow it. Currently, 22 states prohibit big game hunting by anyone under the age of 14 (and in some cases even older). Another 12 states prohibit young people from hunting with parents or other adult supervisors unless they`ve received formal hunter training. According to Hobbs, NRA is working on several fronts to address these issues. Legislatively, NRA-ILA has lobbied to loosen unreasonably restrictive minimum age requirements for hunters. Last year, for example, legislation lowering the minimum age for hunters stalled in the Michigan legislature. This year, NRA-ILA is pushing to pass similar legislation in Wisconsin and looking for opportunities for reform in other states as well. Another 12 states prohibit young people from hunting with parents or other adult supervisors unless they`ve received formal hunter training. NRA is also working at the state and local levels to initiate and improve mentoring programs, to allow young and novice hunters to accompany safe, licensed hunters into the field. "That way," Hobbs said, "they won`t face having to invest 10 or more hours in a training program before they even know whether hunting is for them. Ten hours can seem forever to a kid." Together with the NRA`s Youth Hunter Education Challenge, which refines and reinforces the lessons learned in state-level hunter training, and the NRA Hunter Clinic Instructor Program of advanced skills and safety training for instructors, it adds up to a winning strategy to ensure hunters--and hunting--are safe for the future. How You Can Safeguard Your Sport If you want to protect both our hunting heritage and our Second Amendment freedom--take a young person hunting! All kids are different, and only parents can decide when a particular youngster has the maturity and responsibility to go on their first hunt. By giving a young person--or a novice adult, for that matter--an opportunity to experience our rich heritage of hunting, you can give a gift that will shine far into the future. An old proverb says that if you give a man a fish, he`ll eat for a day, but if you teach a man to fish, he`ll eat for a lifetime. A similar principle holds true for hunting, but in a much more important and profound way. By giving a young person a chance to go hunting, not only will you help develop memories that last a lifetime, you could accomplish more for our sport and the Second Amendment than a lifetime of hard work. 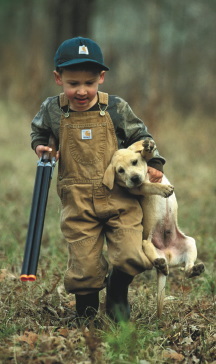 Because young hunters are the safest hunters--both the safest in the field, and the safest for hunting`s future. Last Rites for Our First Freedom? What would happen if hunting died off in America? Each year, American hunters spend more than $700 million on hunting licenses, permits, tags and stamps. Without these monies, who would fund the state and federal conservation programs that keep wildlife populations healthy and in balance? On top of that $700 million, American hunters spend another $20 billion on hunting equipment, transportation, lodging and the like--more than Americans spend on coffee. How many American jobs would be lost without that $20 billion boost to our economy? Yet, compared to the long-term consequences for freedom, those costs could be trivial. Since most hunters are introduced to the sport by their parents, one generation is all it would take to cut off hunting at its knees. Without millions of American hunters as stakeholders, the Right to Keep and Bear Arms could lose one of its most important reservoirs of passion and political strength. So help keep hunting alive and thriving--for the future of our sport and for Second Amendment freedom.